On the grounds of Edinburgh Castle stands a gigantic stone statue of one William Wallace, a man many Scots folk regard as their greatest hero. When screenwriter Randall Wallace clapped eyes on this monument of his distant ancestor, he decided to investigate and what he unearthed was a compelling saga of a commoner who had triumphed against the all-powerful English back in the Thirteenth Century. The facts were sketchy but the many legends surrounding him helped Wallace concoct a tale about a fiercely patriotic savage who rallied the sons of Scotland to fight for their liberty. Under the rule of Edward the First, whole clans were wiped out and the humiliating law of Primo Nocto was instated whereby an English nobleman lording it over a slice of Scotland could claim access to a local maiden on the very night of her marriage. In his script, Wallace has his forebear circumvent this law by marrying in secret. However, when the truth comes out, his bride is captured and her throat cut. So begins a violent uprising that, with Wallace at the helm, snowballs into a relentless battle for freedom. 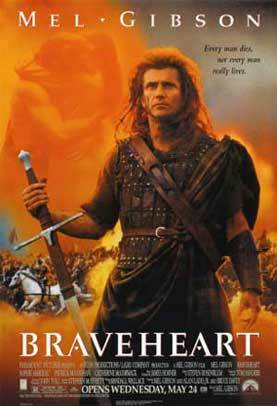 The script for Braveheart landed in Mel Gibson’s lap for consideration and so taken by it was he that he not only pledged to star in but also direct. Decked out in his scraggy mullet and butch kilt, he amassed an army of 1600 Irish reserves and, over a six week period, shot the blood and mud splattered battle of Sterling – a clash that, legend has it, saw Wallace skin the English Commanding Officer and make a belt out of him. It also saw the Scots flash their privates at their enemy, a scene amusingly recreated on screen. In the ‘making of’ documentary, Gibson comes across like a kid in a candy store with all his killer props but his enthusiasm paid off, not least by winning 1995’s Best Picture Oscar. At times, the score is overblown and a tad sappy but the scope of this film is quite spectacular and its images of craggy Scottish highlands and primitive, rain drenched villages linger long after the credits roll.